My friend Donna Romero is a master of light and shadow. If my walls could talk, I’m sure they’d thank me for my friend Donna Romero’s painting, a master class in shadow and light. Bruised by the inescapable 24-hour news cycle of Black Friday, and images of folks fighting over vegetable steamers and life-size teddy bears, I feel it my civic duty to share Seattle’s best-kept secret for a humane, enjoyable, fun, and engaging holiday shopping experience (with no need for fistacuffs): Vashon Island Art Studio Tour . Seriously, if you want a holiday shopping excursion that harkens back to a kinder, gentler time, look no further. For the first two weekends in December, Vashon artists open their studios and offer their paintings, jewelry, prints, ceramics and sculptures to the public. It’s a combo platter of holiday shopping, slowing down, and having fun. You leave the craziness of the mall and the city, and hop a Washington State Ferry to slowville. Trust me, island time is a real thing and just what the doctor ordered this time of year. 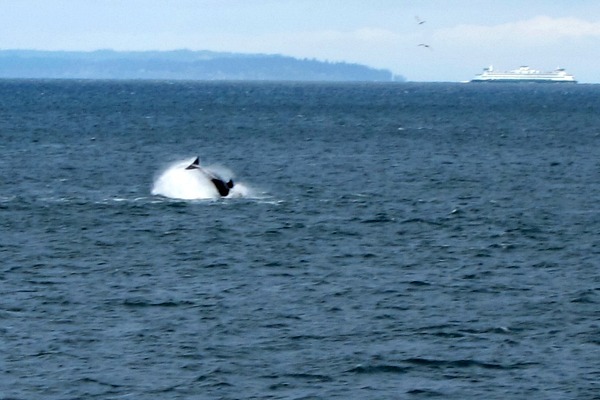 Pack a little patience and a GPS, and head for the Heart of Puget Sound: Vashon Island. Artist and friend Deborah Taylor brings the garden indoors for me. In land mass, Vashon Island is 37 square miles, just slightly larger than Manhattan (just sayin’), and you can’t toss a mushroom cap or unicorn horn without hitting an artist. It’s one of the things I love about Vashon, and with the Vashon Island Art Studio Tour you get meet some of the kindest, most creative and talented people on the island, and they get to meet people who appreciate art, and want to support and nurture the effort and talent. Think of the Vashon Island Art Studio Tour as a little treasure map to the island. Peruse the listings, find the artists or arts you’re interested in, and set a course for rural discovery and convivial shopping. Vashon Island is one picturesque place, and a day of getting lost in its beauty and magic will do you good. 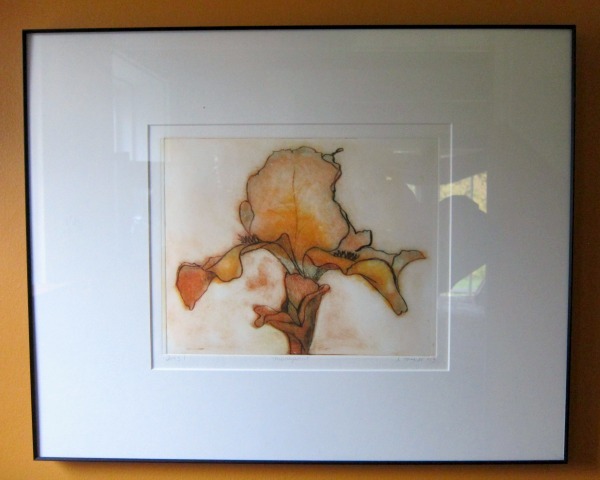 The photos below are favorites from the Vashon Island Art Studio Tour, past and present. Oh and did I mention, it’s okay to buy gifts for yourself. Isola – dinner, local, fresh, creative small plates and worthy meatballs. May Kitchen – Thai cuisine, an island favorite, reservations needed, dinner only. Snapdragon Bakery and Cafe: Vegetarian cuisine and wonderful bakery, Megan and Adam’s Valentine to Vashon, love them and their establishment. God bless them for buttery croissants, raspberry mazurkas, and root beer on tap. Sporty’s – pancakes the size of your head and a spot without pretense. The Hardware Store Restaurant – Vashon’s livingroom, great good food as they like to say. Good place to people watch and sit at the bar. Rock Island Pub and Pizza – Good pizza, great sandwiches and fine salads, and the best-kept secret bar on Vashon, a little room the size of a walk-in closet. The Vashon Island Coffee Roasterie and Minglement – Vashon’s front porch and local coffee klatch, great coffee, teas, snacks, pie, live music on occasion, and a really great place to just hang out and immerse yourself in the island vibe. Vashon Island Baking Company – Sam is another talented baker and her shop is a great stop to help fuel your retail inclinations. Her quiche lorraine is a favorite of mine, as is her chocolate chip cookie. Vashon Tea Shop – Boo’s shop is a friendly spot next to the Vashon Bookshop. Wonderful tea options. Zamorana – Jorge and Effie bring the rich and spicy flavors of Mexico to the island. I love everything they make. Zombies – Not just any old burger joint, Zombie’s uses high quality ingredients and the owner is one creative chef. Country Store & Farm – From Filson to fertilizer, they’ve got you covered. Giraffe – Priscilla’s joyful shop specializing in fair trade items of every shape, size and color. Granny’s Attic Thrift Shop – An islander’s favorite shopping experience. 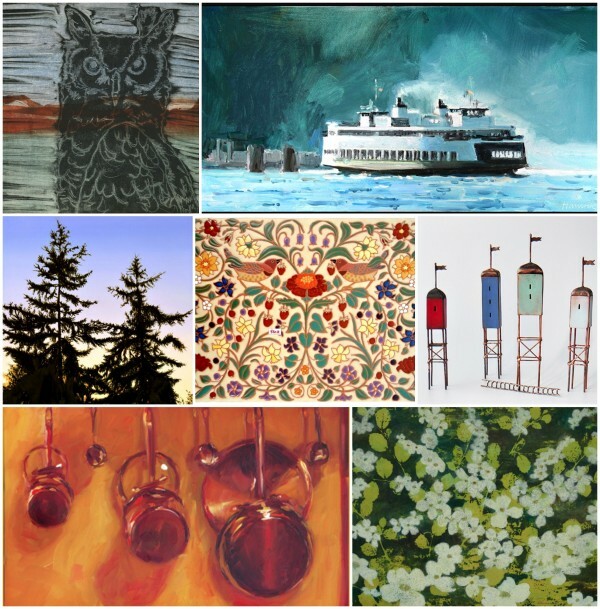 Heron’s Nest Gallery – Vashon Artists bring the best here, sponsored by Vashon Allied Arts. Kronos – Claudia, her daughter Eugenia and faithful companion Perseus (poodle extraordinaire) run a shop that never fails to delight me. Hinge Gallery – New to the island, Brent and Holly add a wonderful presence to our main shopping area, from stellar frame shop, to a gallery, to wonderfully unique gifts and art books. The President of Me – Owner, designer, Rebecca Wittman’s one-of-kind clothing store. Treasure Island – Marci has a keen eye for finding the unique and the vintage. Vashon Bookshop – Vashon’s reading room; we love the Vashon Bookshop! Vashon Pharmacy – Sure you can pick up some aspirin, but you’ll also find an amazing inventory of trinkets and gifts. No bridges here, Vashon Island is accessible only by water and a Washington State Ferry. You have three mainland-to-Vashon dock options: West Seattle’s Fauntleroy, Tacoma’s Point Defiance, and the Kitsap Peninsula’s Southworth. December 5-6 & 12-13 from 10 a.m. – 4 p.m., consider a change of pace and enjoy the season as it was meant be: merry. Sure beats the view from a mall parking lot. Oh Tom, when I win the lottery………..
PS. 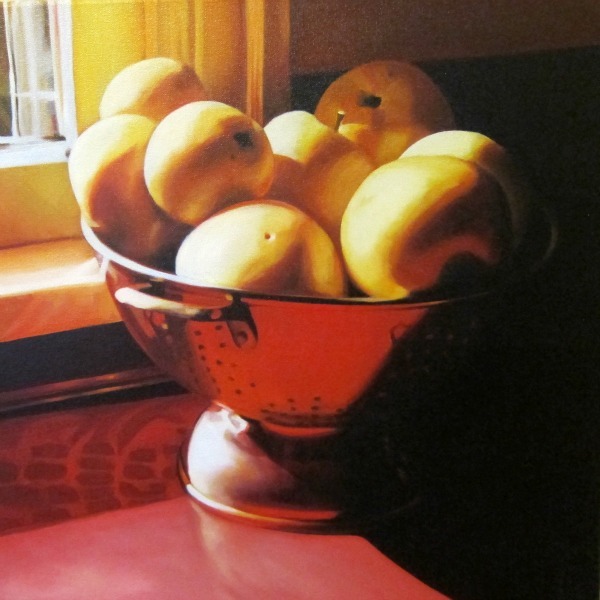 Pam’s “Copper Pots” is just georgeous. I can’t wait to see Pam’s new show this Friday — inside views of Vashon. Will you please run for Mayor. Thank you for such a generous view of our beloved isle. Catherine, only if we hold post dually, my friend. You captured the spirit of our island beautifully, my friend!